A picture is sometimes worth a thousand words, and I've been waiting on this one for a very long time. You can almost hear them exclaiming, "My word, have they gone mad?" Apparently they don't understand that the people are fed up with an outdated monarchy at a time when the aristocracy is raising the tuition at Universities across Britain. Keep your eye on the "Man Who Will Never be King." He's always good for a laugh. 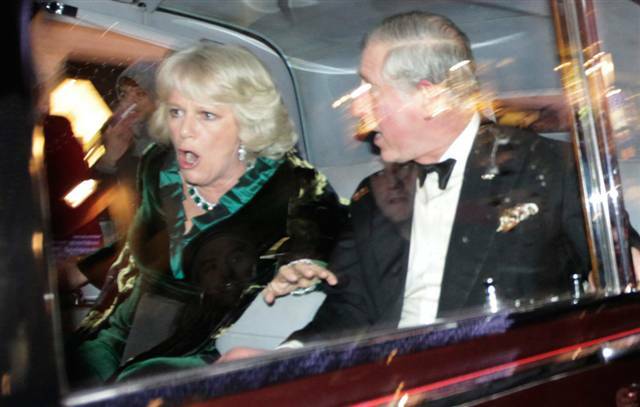 And Camilla seems irked at seeing the poorer classes waste food by throwing eggs at them. I can just hear her thinking, "How dare they! No wonder they're poor!" Great photo, one that I will cherish, not being a big fan of Monarchs.